By the time you read this, the exhibition Rodin and the Art of Ancient Greece, at the British Museum, will be over but I caught it in its last week. What three sculptures of Rodin would you expect to see in such an exhibition? The Kiss? The Thinker? The Burghers of Calais? Well, you would have been right. They were all there in some form or another. The Kiss was a plaster copy of the marble sculpture in Paris. What is - or isn't - Greek, or classical about this? Well, for a start, it is much more intimate and personal than anything from the ancient world. It is Romantic in the History of Art sense but not the popular one. It scandalised its first viewers as a work of erotica, because the female figure is as involved in the embrace as the male. Also in the original, the male is aroused. It was intended as a portrait of Francesca da Rimini and Paolo Maltesta, her brother-in-law, immortalised by Dante in his Inferno, Canto 5. But their lips haven't actually touched - it is a case of basium interruptum. And indeed the lovers were interrupted and killed. All this is lost if you see it just as an anonymous smooch. The Italian subject seems at first to make and obvious link from the ancient Greeks to Rodin via Michelangelo and the French sculptor did visit Italy and greatly admired the statues by Michelangelo that he saw, especially the Prisoners, fighting their way out of their blocks of stone. And the Dying Slave in Paris was another influence. Michelangelo himself saw many Greek statues, though some were Roman copies of Greek originals. Such as the Apollo Belvedere, a Roman copy of an earlier Greek bronze. The same is true of the Laocoon and his sons sculpture, unearthed in 1506 and believed at first to be a Greek original. 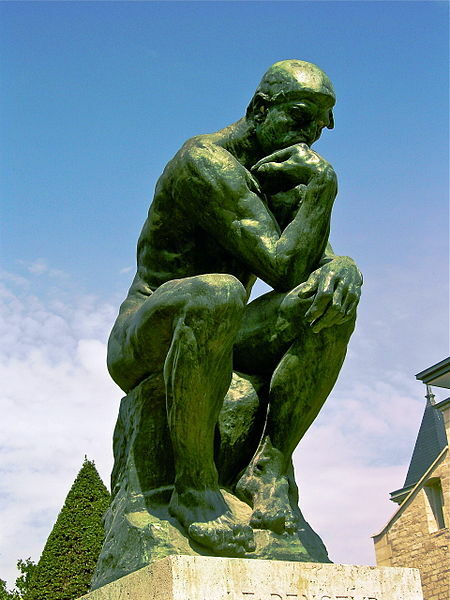 The Thinker was represented in the exhibition by a cast in "patinated plaster," giving it a reddish tinge. This, like the Kiss, was a figure originally intended to embellish The Gates of Hell, a work commissioned from Rodin in 1880, to form an entrance to a Museum of Decorative Arts. 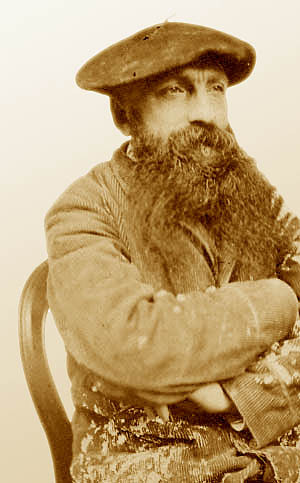 Neither the Museum nor the gates was ever built but Rodin's designs for it occupied him for decades and formed the basis for many of his subsequent achieved works. What a sight it would have been if ever completed! A sort of counterpoint to Ghiberti's Gates of Paradise doors on the Baptistery in Florence. But to revert to the Greeks, Rodin never saw the Parthenon itself but was deeply influenced by the marble friezes he saw in the British Museum. And plaster casts seen in France. However, he bought into the theories of eighteenth century art historian and archaeologist Johann Joachim Winckelmann, who was immensely influential on European art and aesthetics. Rodin would have been surprised if not appalled. It is only relatively recently that it has become generally accepted that Greek marble sculptures were painted. But Rodin wasn't copying the Greeks; he was doing something different. If you like, his marble, bronze and plaster figures were putting Greek sculpture into inverted commas, giving it a modern twist. Influenced by Michelangelo, he practised the non finito technique, leaving his statues deliberately incomplete. And he was fascinated by fragments of classical sculpture and deliberately created "fragments" of work. These figures were not damaged by time and accident but created to be only partial. 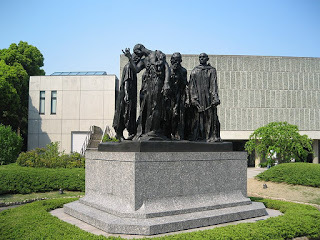 What about the great bronze group, The Burghers of Calais? The original is of course in the eponymous city but Rodin gave permission for a limited number of copies to be made and one is familiar to Londoners from its position in Victoria Gardens on the Embankment of the Thames. This looks like figurative art, plain and simple. These are the six substantial citizens of Calais who were prepared to die to save the other inhabitants under siege from Edward lll. We know their names and a bit about them. They were saved by the intervention of Edward's queen, Philippa of Hainault, but they did not know their fate when they bravely offered to sacrifice themselves for the good of the rest of the population, who were starving after holding out for eleven months.. They have nooses around their necks and are holding the keys to the city. As with so many of Rodin's monumental pieces, this one was controversial, because the figures were too human, showing fear and reluctance. It wasn't heroic for the nineteenth century burghers five and a half centuries after the event commemorated. Rodin's is a very modern view of heroism - scarifice in full knowledge of fear and weakness. It seems a long way from the Greeks, whether the colourless or painted art. Rodin had no referents for what his actual burghers looked like but they are far from idealised; they are real men, who we can believe are hungry, frightened and hopeless. They are Everyman and that's what makes them important. We can identify with them and wonder if we would have done what they did. Although Rodin clearly was influenced by classical sculpture, he does make something new, of his own. His work is far from derivative, always distinctive.